For patients with dementia or cognitive impairment who are removed from their usual place of residence and are experiencing pain or discomfort, anxiety levels are often high. It may not be easy for staff to communicate effectively or understand the often subtle signs that may indicate that a patient's anxiety is escalating. The value of carer information cannot be under estimated. TOP 5 is a simple process that encourages health professionals to engage with carers to gain valuable non-clinical information to help personalise care. This information is documented on a TOP 5 form and made available to every member of the care team to improve communication between the patient, the carer and the health care team. Up to five strategies may be recorded, however, in some cases there may only be one or two relevant strategies. 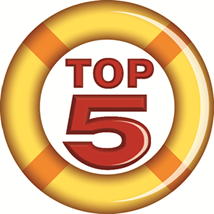 The TOP 5 concept was conceived by and piloted in the Central Coast Local Health District. It has been implemented in selected hospitals across the state by the Clinical Excellence Commission as part of a research project funded by an HCF Health and Medical Research Foundation grant. The Phase 1 study focused on the implementation of TOP 5 in the acute setting. With a second grant, the CEC is integrating the use of TOP 5 in the transition of care. The Phase 2 study involved ten NSW hospitals and focused on the use of TOP 5 in transitions of care between local residential and aged care facilities, community services and ambulance services. The following resources have been developed to assist with the implementation of the TOP 5 program in hospitals, Residential Aged Care Facilities (RACFS), and community services.